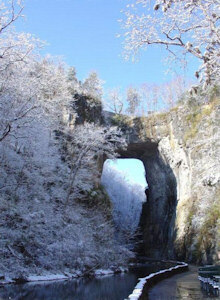 Virginia’s Natural Bridge along with some surrounding acreage is slated to become a state park. Arrangements are being made to open the new park to the public in 2016 but the park can’t be officially owned by the state until the property is debt free. The bridge and surrounding property were initially acquired by the Virginia Conservation Legacy Fund (VCLF) for $9.1 million. A Steering Committee has been formed to focus on helping the VCLF to retire the debt as quickly as possible. The Virginia Association for Parks (VAFP) is a founding member of that committee, along with Destry Jarvis, a private parks consultant whose brother, Jon, directs the National Park Service; Jim Woltz of Woltz and Associates, who brokered VCLF’s purchase of the bridge and property; Faye Cooper, a land conservation advocate and founder/former executive director of the Staunton-based Valley Conservation Council; and three senior State Department of Conservation and Recreation officials: Joe Elton, Deputy Director of Operations; Craig Seaver, State Parks Director; and David Summers, law enforcement manager and state parks’ lead on the transition team. Other members of the committee include VCLF’s Tom Clarke, Jen Bell, and Lynette Mutter. This link enables you to make a tax deductible donation that will be applied specifically to reducing the debt on the bridge and surrounding property. The link can be used beyond the December 2015 timeframe. Please feel free to share the link with family, friends, co-workers, etc., so that as many people as possible can be made aware of the opportunity to participate in this worthwhile initiative. Be a part of Thomas Jefferson's vision for Natural Bridge, which he considered "the most sublime of nature's works." Help this iconic international landmark assume it's rightful place as a Virginia state park, forever preserved as one of America's treasured outdoor spaces for public enjoyment. Visit the site to become a part of making history! Virginia Conservation Legacy Fund is a 501(c)3 formed to facilitate the transition of Virginia's Natural Bridge Park into the Natural Bridge State Park. In 2014, VCLF and concerned citizens rescued the property from the auction block through a complex land deal which included a significantly reduced sales price, the donation of some acreage and other physical assets and a $9 million loan from the Virginia Department of Environmental Quality. Since then, private support has been sought to pay off the loan, which is necessary for the actual state park transition to take place. Your contributions can make this possible. Thank you for joining in this exciting initiative!